The American Outdoor Grill portable collection is designed for long-lasting, unsurpassed performance that produces unbelievable flavor. 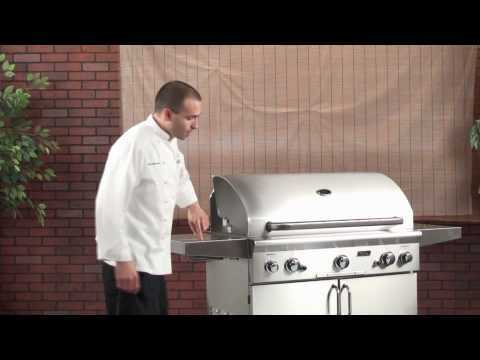 Proudly made in the USA and built to last, this AOG T-Series propane gas grill features commercial grade 304 series stainless steel construction, long-lasting stainless cooking grids and heavy-duty warming rack, and highly-sophisticated stainless steel 32,000 BTU U-shaped burners with integrated support posts for performance and durability. If you enjoy grilling veggies, steaks, and chicken all year long on an incredible grill, the first thing you will appreciate is the brand-new Piezo Rapid Light ignition, firing you up that much quicker with no electricity or batteries. Other great features on this grill include 432 sq inches of primary grilling space, stainless steel vaporizer panels (also called flame tamers) for even heat distribution, solid brass valves with red-flared front knobs for precise temperature control and longer life, and a funneled grease management system with slide-out drip tray for painless clean up. All AOG portable grills ship fully-assembled (except side shelves) on large, durable 2 1/2 inch wheels. Alongside the rest of the AOG line, they boast a stylish, sleek appearance, including the beautiful double-layered satin finish hood, stainless steel construction, and custom-designed analog thermometer with polished bezel. Whether you enjoy entertaining the neighbors or rounding up the family for a fresh meal, this AOG 24-inch T-Series gas grill will add style and cooking excellence to compliment your outdoor lifestyle. Cooking Grid Dimensions 24 X 18"
AOG provides a lifetime warranty for stainless steel burners, and all other grill components are warranted for ten (10) years. The ignition system (excluding batteries), and accessories (including side burners, motors, and thermometers) are warranted for one year from the date of purchase. The vaporizer panels are warranted for three (3) years from date of purchase. When used in a multi-user setting (apartment complexes, multi-family dwelling complexes, schools, hotels, fire stations, police stations, etc. ), AOG warrants this grill to be free from defects in material and workmanship for a period of three (3) years on the stainless steel grill housing, burners, cooking grates, brass valves, inner lines and manifold assemblies. All other components (except batteries) are warranted for ninety (90) days. The multi-user warranty excludes restaurants and settings where the grill usage is primarily commercial. When designing AOG, they stripped down the grill to its most basic design but still include high quality 304 stainless steel. This grill looks like it costs much more than it actually does. The double lined hood has an appealing satin finish and the hood-mounted thermometer with bezel looks stylish. The L- Series features a battery-free electronic push button ignition system and interior halogen lights, great for night grilling. The T-Series features a battery-free push to light piezo ignition system for easy start up. The heart of the grill is the “u-shaped” stainless steel burners which put out plenty of heat for getting a good sear on meats. Another great feature is their grease management system which funnels grease down to the drip pan and helps make cleanup super easy. The best part about AOG is the price point. When you consider American-made grills with this level of quality are usually twice the price, that really is quite impressive. AOG also stands behind their products with a solid warranty. Usually, the burners are one of the most troublesome parts on a gas grill and AOG warrants their burners for 15 years. The company has a great reputation and most of our customers report few problems. This grill doesn't include a wealth of features, but you can still upgrade the grill and add more features. You can still upgrade to get an infrared burner or rotisserie burner if you would prefer to have one. 24 X 18" 24 X 19 1/4" 24 X 19 1/4" 24 X 18"